Develop skills in analysing and evaluating a range of primary and secondary sources. Develop skills in critical inquiry. Demonstrate their understanding of historical events in a variety of forms such as oral presentations, narratives, multimedia presentations and film. Civics and Citizenship – Concepts of personal identity, knowing rights and responsibilities as a citizen, social justice. Appreciate Australia’s place in the Asia–Pacific region and the world. 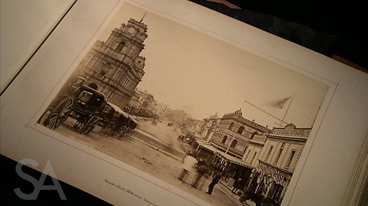 This segment presents a variety of photographs and paintings as evidence of change over time. Discuss the strengths and weaknesses of both photographs and paintings as evidence of a place or event in history. The presenter, Betty Churcher, says of paintings and photographs that ‘each supplies information particular to that medium. Each is a time capsule’. Do you agree? Discuss this comment. Summarise in just one or two sentences why these paintings and photographs are ‘treasures’ in our knowledge and understanding of aspects of Australian history.